We’d love your help. 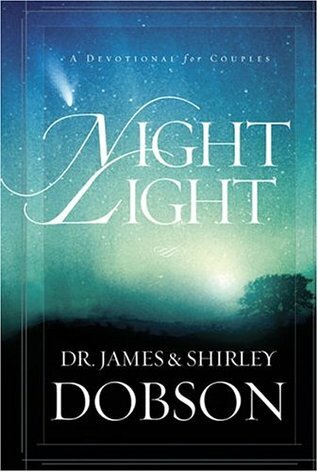 Let us know what’s wrong with this preview of Night Light by James C. Dobson. The challenge of sustaining an intimate, faith-based marriage in today's "hurry-up" society has never been greater. Now Night Light, the inspired, first-ever couples' devotional from Focus on the Family ministry founder Dr. James Dobson and his wife, Shirley, brings spouses together each evening, helping them stay connected with each other and their Lord. Stories that stri The challenge of sustaining an intimate, faith-based marriage in today's "hurry-up" society has never been greater. Now Night Light, the inspired, first-ever couples' devotional from Focus on the Family ministry founder Dr. James Dobson and his wife, Shirley, brings spouses together each evening, helping them stay connected with each other and their Lord. Stories that strike an emotional chord, Scripture readings, provocative questions, prayers, and personal commentary from the Dobsons encourage men and women in their homes and spiritual lives. More than just another devotional, Night Light is a practical, uplifting guide for every couple who longs to experience the joyous, intimate, "three-person" marriage covenant God intended. To ask other readers questions about Night Light, please sign up. This book is meant to be a nightly devotional for married couples. Monday through Friday you read a couple paragraphs and then answer three or four discussion questions. Saturday and Sunday you just read a longer story without questions to review what you've discussed and prepare you for the next week's topic. Even though my husband and I only stuck with it for three weeks, I would still tell other couples to give it a try. We only gave up on it because my husband wanted something that was more o This book is meant to be a nightly devotional for married couples. Monday through Friday you read a couple paragraphs and then answer three or four discussion questions. Saturday and Sunday you just read a longer story without questions to review what you've discussed and prepare you for the next week's topic. This was given to my husband and I as a gift from his brother and sister-in-law. Someone gave it to them or they bought it for themselves and just passed it on to us. We plan to do the same for our best friends who are getting married this summer. The devotions are short and light but they lead to really great conversations. Husband and I even make up our own questions as we're going along. We can't relate to some things that the book talks about just yet (like children) but we talk about it hyp This was given to my husband and I as a gift from his brother and sister-in-law. Someone gave it to them or they bought it for themselves and just passed it on to us. We plan to do the same for our best friends who are getting married this summer. My wife and I absolutely loved this devotional. I appreciated that the questions at the end of each lesson got us to ask questions that we normally wouldn't have thought to ask each other (questions that needed to be asked). We also greatly appreciated that it wasn't 'watered down', meaning it wasn't a devotional with a hint of God on the side but rather it was a full-on God centered devotional. Hubby and I really liked this book. Each week is devoted to a topic. It is introduced on Sunday and each weeknight reading is followed by a few questions tying the topic to your marriage. The topic is then wrapped up on Saturday. This book gave us some great things to think and talk about. I would highly recommend it! Jessie and I did this book for about a year and a half. It had good questions about our marriage, us, and our relationship with Christ. It is short and sweet and easy to do before bed, as long as you are not too tired. I absolutely adore this book! This is a couples devotional that is EXCELLENT! My husband and I are really enjoying going through it together and look forward to the time we spend reading it each night. This was the first couple's devotional my husband and I tried. It was a nice way to reconnect on both a spiritual level and as a couple every evening. We enjoyed it so much we bought copies for a few other couples we know. While I think spending time reading and discussing and sharing spiritual experiences with your spouse is crucial, Dobson's ideas of marriage are rooted too deeply in obsolete gender roles to be relevant to me or my relationships. I'm a pretty young married woman and this was more for people married at least ten years or more (which I am in my 5th year of marriage currently). It was inspiring and very lovely and I enjoyed reading it each night with my husband. I am sure we'll read it again one day together. Devotions that Christian husbands and wives can do nightly (or any night they are able to) together. Brings up awesome discussions about faith, God, and how each your marriage should glorify God. Very good for a prayer time with your spouse. Quick and relevant. I usually hate Dobson, but they did a good job on this one. This is a great book that I got from a friend as an engagement present. Yes, we are still reading it, but every time we go through it, we have the best discussions! Highly recommend this book. This book was given to us 9 years ago at our wedding. An amazing devotional to share with your spouse. Wasn't really an interenting read for my wife and I. I wanted to see what James C. Dobson had to write about and it seems like I not really fan of his writing. This is such a wonderful devotional for couples. Jason and I give it as a wedding gift to every couple that we know that gets married. we loved reading in it each night before going to bed. Great book for couples, I especially love the prayers at the end of each section. Read this before we had kids, would probably be a different read now. Don't recommend it unless you have kids. Scott and I read this the first year we were married. Someone bought it for us as a wedding gift. I remember the "eight cow woman" story! The very first devotion in this book had me crying. Very, very good devotional for couples! Great couples devotiion that you can use again and again! Spend a year reading and doing the exercises and your relationship will be richer for the time you invested. This was a wonderful devotional to share with my husband. I loved that we were able to see and use biblical principles in our marriage. I am passing the book onto a close friend and her husband. The best part of my day is spending time with Jeff every night working through this devotional. This devotional was recommended to us, and was very insightful, I do recommend it for your walk. A licensed psychologist and marriage, family, and child counselor, he is a clinical member of the American Association for Marriage and Family Therapy. For 14 years Dr. Dobson was an associate clinical professor of pediatrics at the University of Southern California School of Medicine, and he served for 17 years James C. Dobson, Ph.D., hosts the daily radio program Dr. James Dobson's Family Talk.